The influence of biological soil crusts in natural ecosystems on structures and processes is well investigated. However, in South-Brandenburg (Germany), it is possible to study the development of biological soil crusts (BSC) during initial ecosystem genesis on two artificial water catchments with well-known ages and under differing starting conditions. 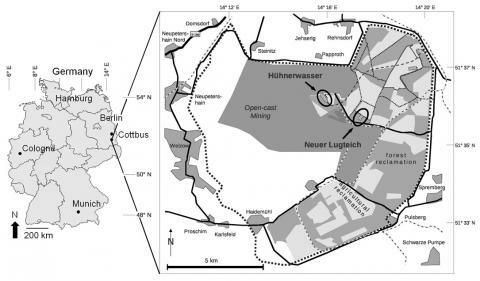 The two experimental sites are located in the recultivation area of the lignite open-cast mining district of southern Brandenburg with a distance of approximately 1 km between them. Two different topographies were constructed at the experimental sites: the experimental plot at the catchment Neuer Lugteich was shaped like a dune, whereas the artificial water catchment Hühnerwasser was modelled as an inclined slope. The catchment Neuer Lugteich is four years older than Hühnerwasser. The original substrate at Neuer Lugteich is more sandy and carbonate-free compared to the original substrate dumped at Hühnerwasser. 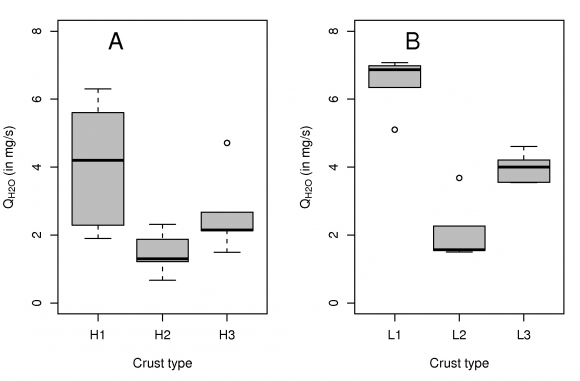 At both sites geomorphological differentiation and crust development were compared and the importance of substrate-dependent water availability and crust type clarified. Once settled, the crusts influenced the water regime of the soils by delaying infiltration through enhanced water repellency, and by limiting water infiltration. Chlorophyll analysis revealed that all crusts were at early stages of development. At Neuer Lugteich, the establishment of the biological soil crusts was closely associated with the vegetation succession, whereas no clear succession of the crusts could be observed at Hühnerwasser. The mosaic-like pattern of the biological soils crusts is associated with the distribution of fine-grained material here. L’influence des croûtes cryptogamiques sur les structures et les processus des écosystèmes naturels est bien caractérisée. Cependant, dans le sud du Brandebourg (Allemagne), il a été possible d’étudier le développement de ces croûtes cryptogamiques dès la genèse de nouveaux écosystèmes sur des bassins-versants artificialisés d’âge connu et dans des conditions initiales différenciées. Les deux sites expérimentaux sont situés dans une zone de remise en culture de mines à ciel ouvert dans le sud du Brandebourg et sont distants d’environ 1 km l’un de l’autre. Deux types de topographies ont été créés sur ces sites expérimentaux : la station de Neuer Lugteich a été façonnée à la manière d’une dune, tandis que l’impluvium artificialisé de Hühnerwasser possède un profil de plan incliné. Le site de Neuer Lugteich a quatre ans de plus que celui de Hühnerwasser. Le matériau originel de Neuer Lugteich est plus sableux et décarbonaté que celui de Hühnerwasser. Pour les deux sites, les différences géomorphologiques et de développement des croûtes cryptogamiques ont été comparées et le rapport entre la disponibilité hydrique des substrats et le type de croûte éclairci. Après leur installation, les croûtes influencent le régime hydrique des sols en retardant l’infiltration en raison d’une plus forte hydrophobie, et en limitant l’infiltration totale. L’analyse des teneurs en chlorophylle révèle que toutes les croûtes sont à des stades initiaux de développement. A Neuer Lugteich, la mise en place des croûtes cryptogamiques est étroitement associée aux successions végétales, tandis qu’à Hühnerwasser, aucune succession claire ne transparaît. Ici, la trame mosaïquée est corrélée avec la répartition de la fraction fine du substrat. We are grateful to Gabriele Franke and Florian Fochmann for their assistance with the lab analysis, to Werner Gerwin for his assistance with the location maps, and to Emily Zerlin for proofreading the manuscript. This study is part of the Transregional Collaborative Research Centre 38 (SFB/TRR 38) and supported by the Deutsche Forschungsgemeinschaft (DFG) and the Brandenburg Ministry of Science, Research and Culture (MWFK). Thanks to Vattenfall Europe Mining AG for providing the research site and the location maps. We also thank the anonymous reviewers for their truly helpful comments, as well as Samuel Etienne, Gilles Arnaud-Fassetta and the edition staff of Geomorphologie for their assistance with the manuscript and for the French translation. 1In initial ecosystems cyanobacteria, algae, fungi, mosses, and lichens are the first organisms which colonise the substrate. These cryptogams often form a biological crust in the upper first millimetres of the surface (Belnap and Lange, 2001). Cyanobacteria excrete exopolysaccharides (Tisdall and Oades, 1982; Vandevivere and Baveye, 1992), influence the substrate stability and reduce erosion of substrate and soil (Eldridge and Greene, 1994; Belnap and Gillette, 1997; Leys and Eldridge, 1998). Together with the rhizoids of mosses they form a network of elements and bind the particles of the substrate. In addition, they contribute as first to the accumulation of soil organic matter (SOM; Veste et al., 2001a). However, crust type and degree of substrate utilisation depend on various abiotic factors and predefine further ecosystem development. For example, microclimatic boundary conditions, surface stability, chemical properties of the substrate and grain size distribution play an important role (Veste et al. 2001a; Veste and Littmann, 2006). The sealing of the soil surface by the biological crusts (BSC) influences hydrological processes. Also, water movement and infiltration are influenced by particle size distribution, porosity and water retention capabilities (Verrecchia et al., 1995). Furthermore, BSCs may excrete organic substances which upon swelling can contribute to pore clogging and, hence, to further reduction of hydraulic conductivity (Kidron et al., 1999; Fischer et al., 2010). On the other hand, hydrophobicity can be observed there. This phenomenon is defined as a situation during which the cohesive forces of water molecules are stronger than the adhesive forces between the water molecules in the soil or crust, resulting in a high contact angle of the water with the surface (Wessel, 1988). It is well known that biological soil crusts may alter soil pH (Garcia-Pichel and Belnap, 2001), which therefore can promote the colonisation of higher plants according to their acidity behaviour. 2On the recultivated areas of an opencast-lignite mine in Lusatia, southern Brandenburg, Germany, it was possible to study the influence of biological soil crusts on ecosystem development from the very beginning. Here, on two man-made water catchment areas, different substrates from the forefront of the opencast mine were dumped and planed, which were also variously sorted. Shortly after the forming of the fresh surfaces, different cryptogams were observed. 3The development of biological crust types inter alia depends on abiotic factors like climate, parent material, availability of nutrients, relief, grain size composition, sorting of the particles, availability of water absorption and on anthropogenic activity. It was the goal of this study to compare biological soil crusts under conditions of differing substrates in artificially constructed water catchments, where other abiotic conditions, like topoclimate and atmospheric deposition, can be assumed to be very similar. This would allow us to estimate the role of BSCs for geomorphological differentiation on young recultivated substrate. 4To target this goal, chlorophyll amount, organic matter content, as well as pH, were determined and the structure of the crusts was investigated using optical microscopy. This approach is typically used to classify BSCs (Belnap and Lange, 2001). In addition, we characterised the water regime of the crusts using water infiltration and repellency tests. The substrates of the catchment Hühnerwasser are modelled as an inclined plane. At the catchment Neuer Lugteich, we studied the soil crust types on a catena of an artificial dune. 5The artificial catchments Hühnerwasser and Neuer Lugteich are located in the recultivated landscape of the Lusatian mining district near Cottbus (about 150 km south east of Berlin, Germany; fig. 1). Above a clay layer on the catchments basis with minimum 1 m thickness, Pleistocene sediments from the Saale glacial period were dumped with a minimum depth of 2 m. The clay serves as an aquiclude and the Pleistocene cover sheet provides initial conditions of soil development. The climate in southern Brandenburg is transitional between oceanic and continental. The mean annual rainfall amounts to 559 mm and the mean annual temperature to 9.3°C (data from DWD meteorological station Cottbus). The Hühnerwasser (fig. 2) is dumped with Quaternary substrates in 2005 as an artificial water catchment for the Hühnerwasser creek which should be rebuilt in the course of the recultivation of the mining area (Kendzia et al., 2008). The catchment with a size of approximately 60,000 m2 is a study area to investigate patterns and processes of initial ecosystem development (Gerwin et al., 2009). It is modelled as an inclined plane. After smoothing the dumped overburden the substrates were not further reworked. The vegetation is dominated by Trifolium arvense. Other frequent grasses are Agrostis capillaries, Calamagrostis epigejos, Poa palustris and Bromus tectorum and primary succession is still going on (Zaplata et al., 2009, 2010). The distribution of the grass species at the water catchment Hühnerwasser is generally very heterogeneous (Zaplata et al., 2010). Here, we studied biological soil crusts at the surface of the Quaternary substrate at three different plots which are distributed in the upper part of the water catchment (fig. 3). The catchment Neuer Lugteich was constructed in 2001. It has a size of approximately 40,000 m2 and serves as a study area for geo-ecological monitoring of flora and fauna from the forefield of the opencast-mine on Tertiary and Quaternary substrates and at an artificial lake (Kendzia et al., 2008; Lemmnitz et al., 2008). Here we studied biological soil crusts on Quaternary substrates which are dumped as an artificial dune, about 50 m long, 1.5 m high, and 7 m wide (fig. 4). The characteristic plant species of the sampling plots is Corynephorus canescens, which is a typical pioneer species of acid Central European inland sand dunes. For a general comparison, see tab. 1. Fig. 1 – Location map of the study sites Hühnerwasser and Neuer Lugteich near Cottbus. Fig. 1 – Carte de localisation des sites d’étude Hühnerwasser et Neuer Lugteich, à proximité de Cottbus. Fig. 2 – Overview photograph of the artificial catchment Hühnerwasser. Fig. 2 – Vue générale du bassin-versant artificiel de Hühnerwasser. H2. The photograph was taken at sampling point H2. Fig. 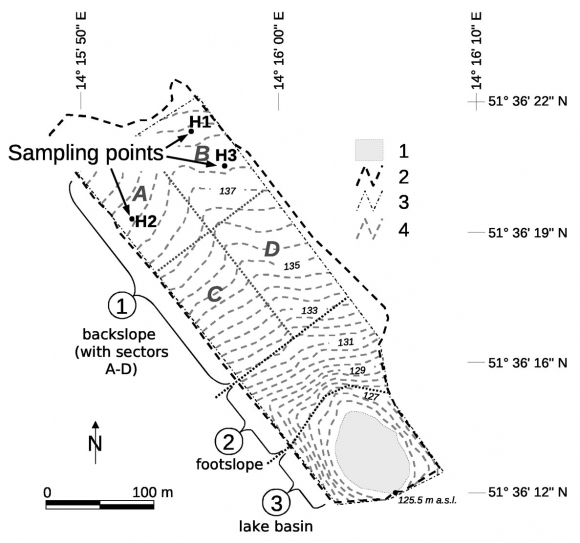 3 – Location of the sampling points H1, H2 and H3 at Hühnerwasser (Gerwin et al., 2009, modified). Fig. 3 – Localisation des points d’échantillonnage H1, H2 et H3 à Hühnerwasser (Gerwin et al., 2009, modifié). 1 : surface initiale du lac (2005/2006) ; 2 : périmètre ; 3 : frontière ; 4 : altitude (m a.s.l., octobre 2005). Fig. 4 – Overview photograph of the artificial dune at the catchment Neuer Lugteich. Fig. 4 – Vue générale de la dune artificielle de Neuer Lugteich. Tab. 1 – Characterisation of Hühnerwasser and Neuer Lugteich. Tab. 1 – Caractéristiques des sites Hühnerwasser et Neuer Lugteich. 6Sampling. On both catchments we defined three types of biological soil crust: (i) cyanobacterial and green algae crusts (H1, L1; fig. 5 and fig. 6, top) on the soil surface with no vegetation, (ii) cyanobacteria and green algae (H2, L2; fig. 5 and fig. 6, middle) between sparse vegetation cover, e.g. with Trifolium arvense at Hühnerwasser and Corynephorus canescens at Neuer Lugteich, and (iii) biological soil crusts with mosses (H3, L3; fig. 5 and fig. 6, bottom) between dense vegetation. 7Imaging and optical microscopy. Top view photographs of the crusts were taken from a height of approximately 1.5 m, where surrounding vegetation was visible (fig. 5). For the micro-photographs of the top views of undisturbed, wetted crusts optical reflecting microscopy was used (fig. 6). 8Soil analysis. On each sample with biological soil crusts, soil pH was measured in water suspension (soil/H2O = 1 : 2.5) and organic carbon concentration was determined by dry combustion using an Elemental Analyser. Texture was analysed by wet sieving and fractionation after DIN ISO 11277 (2002; pipette method) on 20 g of samples with biological soil crust and on substrate samples from below the biological soil crusts. The sampling area was approximately 100 cm2 and prior to analysis the samples were homogenised. Unless stated otherwise, ANOVA and linear regression analysis were performed. All statistical tests were performed at p < 0.05. Fig. 5 – Top view pictures of the crusts. Fig. 5 – Vue sommitale des croûtes cryptogamiques. H1, H2, H3 = Hühnerwasser; L1, L2, L3 = Neuer Lugteich, arrow points to cyanobacteria and green algae (L2) and mosses (L3). H1, H2, H3 = Hühnerwasser ; L1, L2, L3 = Neuer Lugteich. Les flèches signalent les cyanobactéries et les algues (L2) et les mousses (L3). Fig. 6 – Top view microscopic pictures of the crusts. Fig. 6 – Microphotographies de la surface des croûtes cryptogamiques. H1, H2, H3 = Hühnerwasser; L1, L2, L3 = Neuer Lugteich. 10where CChlA is the chlorophyll concentration of the crust in µg cm-2, OD664 is the optical absorbance at 664 nm, OD647 is the optical absorbance at 647 nm, VExtr is the volume of the acetone extract in ml, Acore is the area of the soil core in cm2. 12Imaging and optical Microscopy. The establishment of the biological soil crusts on the artificial dune at Neuer Lugteich was closely associated with the vegetation succession. While the density of pioneer species increased, also the biological soil crusts built up of cyanobacteria and green algae covered the entire area between the vegetation spots (L2). In later development stages of the vegetation, mosses are more prominent in the biological soil crusts (L3). In contrast to the artificial dune, on the newly created water catchment Hühnerwasser the biological soil crusts were distributed in a more mosaic-like pattern and no clear succession of the crusts was observed (fig. 5). On the surface of the crusts H1 and L1 (H1, L1; fig. 6, top), dominating sand grains were physically stabilised in their contact zones by relative few cyanobacteria and green algae. The pore space was dominated by the mineral matrix. On the surface of crusts H2 and L2, filamentous cyanobacteria and algae partially filled in the matrix pores and enmeshed sand grains, and in a wet condition extracellular polymeric substances (EPS) clog the available pore space. Crusts H3 and L3 were characterised by intense growth of mosses, which covered most of the surface, and by few green algae and cyanobacteria. 13Texture analyses. At Neuer Lugteich, the content of fine material in the crust increased from the backslope to the footslope of the dune, which is typical for a catena. The substrate contained predominantly coarse sand and middle sand here. In L1 the content of silt and clay amounts to 2.64% and was low compared to L3, where the silt and clay content reached 3.65%. At Hühnerwasser, the trend of textural changes did not follow the toposequence, where the substrate contained more fine-grained material than at Neuer Lugteich (fig. 7). The contents of silt and clay in the crusts were 23.8% in H1, 15.9% in H2 and 30.5% in H3. Compared to H3, the content of fine-grained material is low in H2. Fig. 7 – Results of texture analysis (grain size classes) of crusts and subjacent substrate at Hühnerwasser (A) and Neuer Lugteich (B). Fig. 7 – Analyse texturale (classes granulométriques) des croûtes et du substrat sous-jacent à Hühnerwasser (A) et à Neuer Lugteich (B). 1: 630-<2000 μm (coarse sand); 2: 200-<630 μm (medium sand); 3: 63-<200 μm (fine sand); 4: 20-<63 μm (coarse silt); 5: 6.3-<20 μm (medium silt); 6: 2-<6.3 μm (fine silt); 7: <2 μm (clay). 1 : 630-<2000 μm (sables grossiers) ; 2 : 200-<630 μm (sables moyens) ; 3 : 63-<200 μm (sables fins) ; 4 : 20-<63 μm (limons grossiers) ; 5 : 6.3-<20 μm (limons moyens) ; 6 : 2-<6.3 μm (limons fins) ; 7 : <2 μm (argiles). 14pH-values. At Hühnerwasser, the pH values (fig. 8) were about 7 (neutral) in all biological soil crusts. This also gave rise to appearance of Trifolium arvense as a dominating species on the neutral soils in this water catchment. 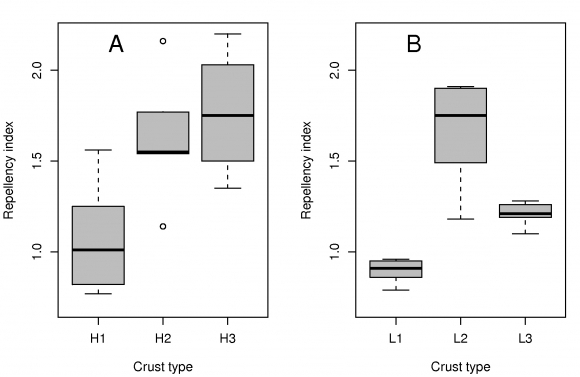 No clear correlation between crust development and pH could be observed. Though the original substrate contained 0.015% carbonates, it was not detected in the crusts. SEM-EDX revealed that Ca found in the crust was present in feldspars only. At Neuer Lugteich, the crusts were moderately acidic. In the crust type L1 the pH values were low (4.95) compared to L2 and L3, where pH increased significantly to 5.14 and to 5.19, respectively (fig. 8). Fig. 8 – Boxplot of pH-values (soil/H2O = 1 : 2.5) at Hühnerwasser (A) and Neuer Lugteich (B). Fig. 8 – Valeurs du pH (rapport sol/eau = 1 : 2,5) à Hühnerwasser (A) et à Neuer Lugteich (B). 15Soil Organic Carbon (Corg). The parent substrate dumped at Hühnerwasser during construction of the catchment contained on average 0.16% to 0.22% Corg (Gerwin et al., 2009), and the uncrusted topsoil sampled three years after construction contained approximately 0.25% Corg, indicating almost no change of Corg where crusts were absent (fig. 9A). In the crusts, maximum Corg concentrations were found at H2 (0.51%) but were not significantly lower in H1 (0.47%) and in H3 (0.44%). Corg was generally higher at Hühnerwasser than at Neuer Lugteich (fig. 9), where it was minimal at L1 (0.23%) and increased significantly towards L3 (0.44%). Fig. 9 – Boxplot of soil organic carbon contents at Hühnerwasser (A) and Neuer Lugteich (B). Fig. 9 – Teneur en carbone organique des sols à Hühnerwasser (A) et à Neuer Lugteich (B). Range of Corg background immediately after dumping [0.16-0.22% Corg, (Gerwin et al., 2009)] indicated. Gamme de carbone organique présent dans le système juste après remblaiement [0,16-0,22 % Corg, (Gerwin et al., 2009)]. 16Chlorophyll content. 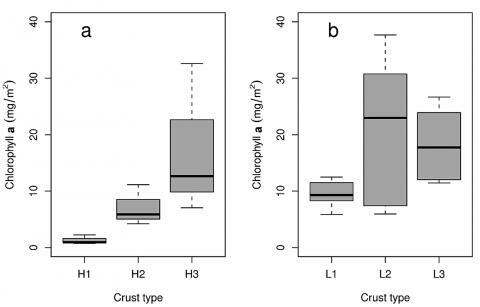 At Hühnerwasser, chlorophyll A concentrations increased significantly with crust type from H1 (0.97 mg/m2) to H3 (13.32 mg/m2). At Neuer Lugteich, the content of chlorophyll A tended to increase from L1 (8.41 mg/m2) to L2 (28.26 mg/m2), and at L3 the value tended to decrease to 23.02 mg/m2 (fig. 10). At L2, the variation is comparatively high, which can be attributed to the patchiness of the crust cover. Fig. 10 – Boxplot of Chlorophyll A contents of the crusts at Hühnerwasser (A) and Neuer Lugteich (B). Fig. 10 – Teneurs en chlorophylle A des croûtes cryptogamiques à Hühnerwasser (A) et à Neuer Lugteich (B). 17Water infiltration and repellency. Water infiltration was highest on H1 and L1, where the pore space was dominated by the sandy matrix, and lowest in H2 and L2 where filamentous cyanobacteria and algae partially filled in the matrix pores and enmeshed sand grains, and where EPS clog the available pore space when wet. Appearance of mosses (H3 and L3) led to an increase of water infiltration. 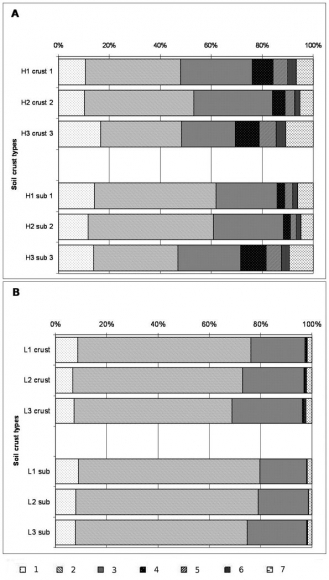 Infiltration rates were significantly lower (p = 0.025) in Hühnerwasser compared to Neuer Lugteich (fig. 11). On the catchment Hühnerwasser the water repellency indices (Ri) increased significantly from 1.01 at H1 to 1.55 at H2 (p = 0.039, t-test), and tended to increase from 1.55 at H2 to 1.75 at H3 (p = 0.58, t-test). On the artificial dune at Neuer Lugteich, the Ri values increased significantly from 0.91 at L1 to 1.75 at L2 (p = 0.008, Wilcoxon-test), and tended to decrease from 1.75 at L2 to 1.21 at L3 (p = 0.095, Wilcoxon-test). Microinfiltrometer method, tip diameter 1.0 mm. Méthode par microfiltromètre, diamètre 1.0 mm. 18Microbiotic soil crusts developed on both investigated initial ecosystems. However, their feedback with geomorphological processes differed between both experimental sites. The establishment of the biological soil crusts on the artificial dune at Neuer Lugteich was closely associated with the vegetation succession. Although Neuer Lugteich is four years older than Hühnerwasser, a rapid development of the vegetation was observed on the Neuer Lugteich only in the recent years. The presence of higher vegetation results in a reduction of the local wind speed and an increase of fine-grained particles (Danin, 1996), and enables the establishment of cyanobacteria and green algae (L1) in the lee of the higher plants. By the time that the density of pioneer species increased, also the biological soil crusts built up of cyanobacteria and green algae covered the entire area between the vegetation spots (L2). 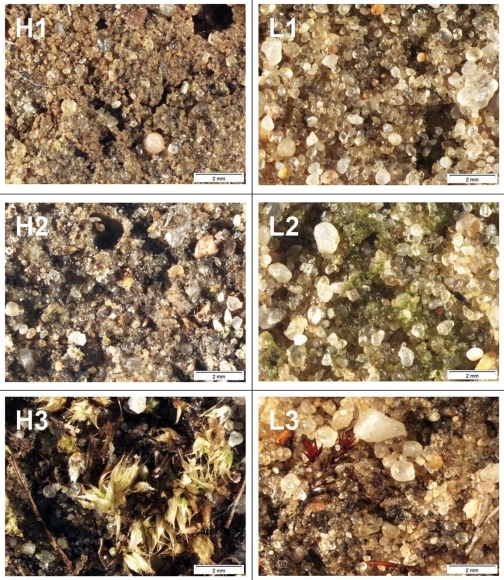 In later development stages of the vegetation, mosses were more prominent in the biological soil crusts (L3; fig. 5). 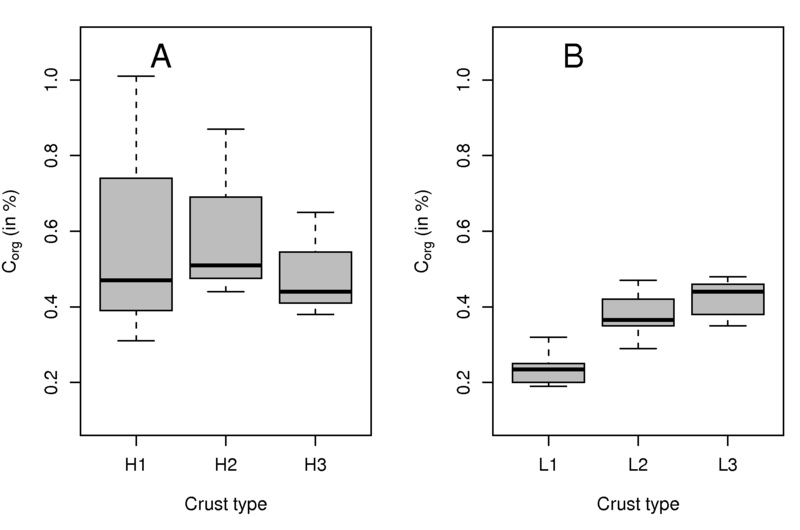 Similar crust stages were observed on natural sand dunes in Brandenburg by T. Fischer et al. (2010). Crusts contain cyanobacteria and chlorophyta, but without lichens and mosses, generally show maximal chlorophyll contents of 100 mg/m2. The presence of mosses and lichens increases area related chlorophyll content to an amount up to 900 mg/m2 (Belnap and Lange, 2001). 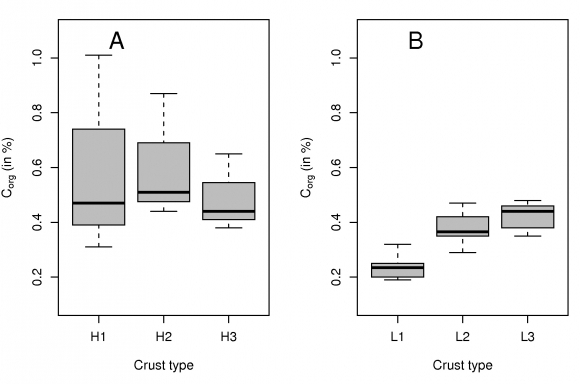 The chlorophyll contents of the crusts in this study indicate early crust development (fig. 10). 19The development of various crust types is often accompanied by an increase of fine-grained material (Danin, 1996; Fearnehough et al., 1998). Furthermore, in the denser vegetation patches the micro-climatic boundary conditions are improved for the development of the biological soil crusts. The higher moisture-holding capacity by the higher silt and clay content in combination with the reduced evaporation as a result of lower wind speed and decreased shading by the vegetation led to longer photosynthetic activity of the biological soil crusts and to improved growth conditions especially for the mosses (Veste et al., 2001b; Veste and Littmann, 2006). 20In contrast to the artificial dune, on the newly created water catchment Hühnerwasser the biological soil crusts were distributed in a more mosaic-like pattern and no clear succession of the crusts could be observed. In general, the higher silt and clay contents at the Hühnerwasser catchment were also reflected in the different crusts types (H1-H3). 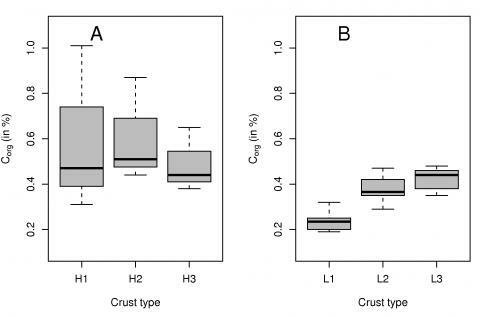 Although the substrates differed in grain-size distribution and pH, early crust development stages were characterised by the dominance of cyanobacteria and green algae in crusts H1 and H2 and L1 and L2, respectively. During these first two stages of crust development, growth was dominated by occupation of the open sand surface, which stabilised the surface against wind erosion. The higher water-holding capacity of the fine-grained particles brought better moisture conditions and promoted the establishment of mosses. Dense moss patches were found in such places at the Hühnerwasser. 21These small-scale differences of the micro-habitats have large impact on the development of biological soil crusts and the top soil properties on both initial ecosystems. The differences between the sampling points at the catchment Hühnerwasser and the catchment Neuer Lugteich are summarised in tab. 2. Different installation regimes resulted in differing substrate qualities. The Hühnerwasser consists of Quaternary substrates which are dumped and planed with open mining technology from the overburden of the open mining forefield. It is modelled as a slope. On the other hand, at the Neuer Lugteich Quaternary sand was dumped forming an artificial dune. Tab. 2 – Comparison of the general geomorphological observations of Hühnerwasser and Neuer Lugteich. Tab. 2 – Comparaison des observations géomorphologiques à Hühnerwasser et à Neuer Lugteich. 22The variability of SOM contents at Hühnerwasser was higher than at Neuer Lugteich suggesting that the development of SOM was more differentiated at Hühnerwasser (fig. 9). It has to be considered that the catchments had different substrate properties regarding grain-size and especially acidity (pH Neuer Lugteich: 5.1; pH Hühnerwasser: 7.0). The initial substrates dumped at the Hühnerwasser contained carbonates and, hence, had higher pH. However, decrease of pH from 8.2 since installation to 7.0 at sampling four years later points to leaching of carbonates (Schaaf et al., 2009). It can be assumed that the higher pH values on Hühnerwasser compared to Neuer Lugteich will accelerate the speed and direction of the vegetation succession. In the near future the fast vegetation development of higher plants on this site (Zaplata et al., 2009, 2010) will most likely result in a closed dry grassland ecosystem, where open spaces are reduced. 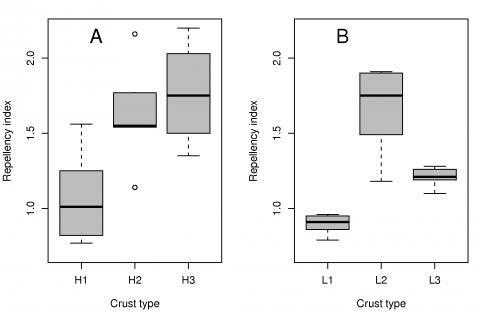 Shading of the biological soil crusts by the higher plants is an important competition factor (Jentsch and Beyschlag, 2003) and has negative implication for the crust development. 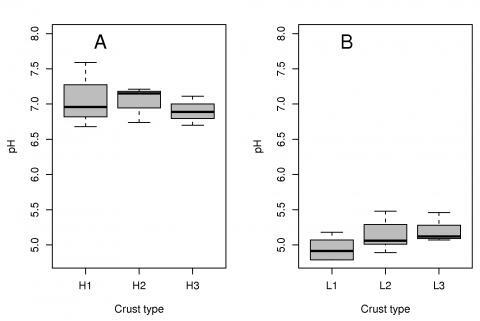 23The differences in the fine-grain material between the experimental sites are important for the different development of the top soil crusts. At Hühnerwasser, sandy substrates with high contents of silt and clay are poorly sorted, and spatially re-distributed by fluvial and aeolian processes. On the other hand, wind is the driving geomorphological process for the distribution of the grains on the artificial dune at Neuer Lugteich, which consists mainly of fine sand. Therefore, the biological soil crust types at Hühnerwasser are very heterogeneously distributed and developed. Different crust types occur patchy on small areas. In contrast, on the artificial dune at Neuer Lugteich the crust types can be clearly distinguished along the dune from the top towards the stable backslopes and footslope. This also clearly indicates that not only types but also spatial distribution and density of the soil crusts influence the development of SOM on initial surfaces. 24These differences in the biological soil crusts as well of the fine-grained material have large influence on the hydrological and erosion processes. By lower infiltration (fig. 11), swelling and shrinking of silty and clayey substrate and microbial EPS (Kidron et al., 1999; Fischer et al., 2010), followed by surface runoff during intensive rainfall events, the probability of fluvial dislocation of the substrate on Hühnerwasser was higher than potential erosion by wind. Due to physical binding forces and the presence of cyanobacteria, algae and mosses, holding the substrate together, the wind erosion was reduced. Contrarily, the rather weak water storage and the more sandy substrate of the artificial dune at Neuer Lugteich was subject rather to wind erosion than to water erosion, because precipitation could infiltrate into the sand more easily and water runoff was lesser (fig. 12). Fig. 12 – Boxplot of water repellency indices Ri (according to P.D. Hallett and I.M. Young, 1999) of the crusts at Hühnerwasser (A) and Neuer Lugteich (B). Fig. 12 – Valeurs des indices de répulsivité hydrique Ri (d’après P.D. Hallett et I.M. Young, 1999) des croûtes cryptogamiques à Hühnerwasser (A) et à Neuer Lugteich (B). 25In general, inhibited water infiltration and surface runoff promotes and accelerates sheet erosion and the formation of small erosion rills which develop further to gullies. At Hühnerwasser, the situation is more complex, due to small-scale differences in surface properties. Here, large precipitation events play a key role in the creation of the gully system (Gerwin et al., 2009). 26At a natural water catchment in China, however devastated, and with substantially steeper slope than the Hühnerwasser, T. Uchida et al. (2000) measured the influence of sediment yield, surface runoff, erosion, and saturated hydraulic conductivity. They observed that biological soil crusts within the lower slope of the catchment favour surface runoff, but nevertheless water erosion and wind erosion was reduced. Gullies are mainly in the upper area, which did not cover with biological soil crusts. At the Hühnerwasser catchment, biological soil crusts are in the upper and lower slope and gullies are mainly in the lower slope, but the processes of reducing of water erosion and wind erosion through biological soil crusts are the same. 27On sandy substrates, water infiltration should be rather fast. When covered by biological soil crusts, several studies under arid ecosystems showed that water infiltration is limited (Veste et al., 2001a; Yair, 2001; Belnap, 2006). 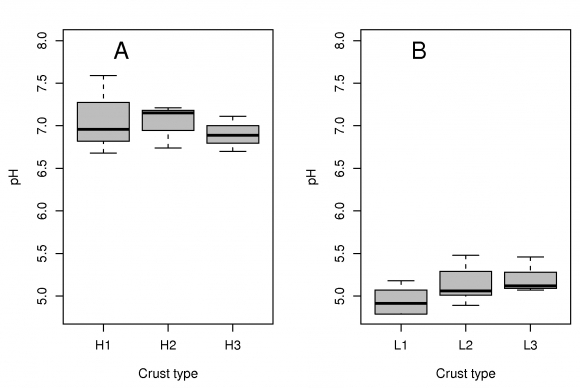 Unlike many biological soil crusts described in the literature, the crusts at both experimental sites are not pronounced hydrophobic, yet surface polarity differs between the crust types. Infiltration decreased by the swelling of the exo-polysaccharides of the microorganisms (Kidron et al., 1999; Fischer et al., 2010). The same effect can be observed on the artificial sand dune of the Neuer Lugteich and on Hühnerwasser. Furthermore, infiltration rates were lower at Hühnerwasser, most likely due to the more clayey substrate. Hence, water infiltration is influenced by two factors: the crust type, which is least when cyanobacteria and green algae form a dense cover on the surface (H2 and L2), and the texture. In addition, the water repellency indices, which decrease with surface polarity, increased with the establishment of cyanobacterial crusts (H1, H2, L1, L2) and, thus, contributed to a delay of the infiltration process. The influence of particle size, swelling of biological soil crusts and precipitation is reported by E. Verrecchia et al. (1995) in arid sand dunes. They found that the infiltration of precipitation is higher in dry summer months, but after wet periods and swelling of the crusts, infiltration is reduced and runoff along the slope is higher. With further development of the crusts and the establishment of the mosses on the sand dunes the water repellency is reduced again. However, in drylands with low rain intensity surface runoff is reduced by large moss patches (Yair, 2001; Yair et al., 2008). 28In two initial ecosystems, geomorphological differentiation was related to crust development, where substrate-dependent, water availability defined the crust types. Once settled, the crusts influenced the water regime of the soils by delaying infiltration through enhanced water repellency, and by limiting water infiltration. On a dune catena, the establishment of the biological soil crusts was closely associated with the vegetation succession, whereas no clear succession of the crusts could be observed in a newly created artificial water catchment. The mosaic-like pattern of the biological soils crusts is associated with the distribution of fine-grained material here. Belnap J. (2006) – The potential roles of biological soil crusts in dryland hydrologic cycles. Hydrological Processes 20, 3159-3178. Belnap J., Gillette D.A. (1997) – Disturbance of biological soil crust: impacts on potential wind erodibility of sandy desert soils in southeastern Utah. Land Degeneration and Development 8, 355-362. Belnap J., Lange O.L. (2001) – Biological soil crusts: Structure, function, and management. Ecological Studies 150, Springer, Berlin, Heidelberg, New York, 503 p.
Danin A. (1996) – Plants of desert dunes. Springer, Berlin, 177 p.
DIN ISO 11277 (2002) – Bodenbeschaffenheit – Bestimmung der Partikelgrößenverteilung in Mineralböden – Verfahren mittels Siebung und Sedimentation. Beuth, Berlin, 38 p.
Eldridge D.J., Greene R.S.B. (1994) – Microbiotic soil crusts: a review of their roles in soil and ecological processes in the rangelands of Australia. Australian Journal of Soil Research 32, 389-415. Fearnehough W., Fullen M.A., Mitchell D.J., Trueman I.C., Zhang J. (1998) – Aeolian deposition and its effect on soil and vegetation changes on stabilized desert dunes in northern China. Geomorphology 23, 171-182. 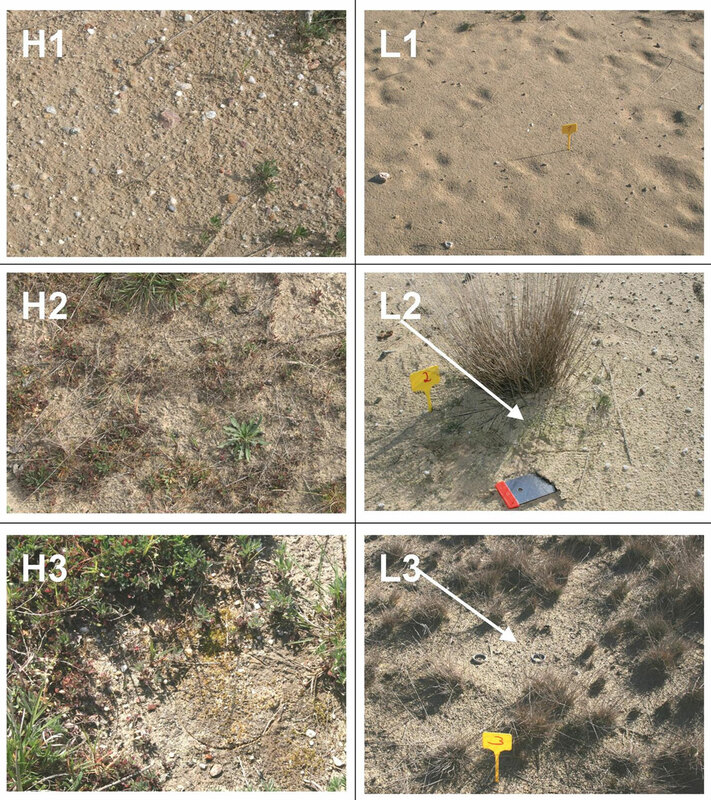 Fischer T., Veste M., Wiehe W., Lange P. (2010) – Water repellency and pore clogging at early successional stages of microbiotic crusts on inland dunes, Brandenburg, NE Germany. Catena 80, 47-52. Garcia-Pichel F., Belnap J. (2001) – Small-scale environments and distribution of biological soil crusts. In Belnap J., Lange O.L. (Eds. ): Biological Soil Crusts: Structure, Function, and Management. Springer, Berlin, Heidelberg, New York, 193-201. Gerwin W., Schaaf W., Biemelt D., Fischer A., Winter S., Hüttl R.F. (2009) – The artificial catchment “Chicken Creek” (Lusatia, Germany) A landscape laboratory for interdisciplinary studies of initial ecosystem development. Ecological Engineering 35-12, 1786-1796. Hallett P.D., Young I.M. (1999) – Changes to water repellence of soil aggregates caused by substrate – induced microbial activity. European Journal of Soil Science 50, 35-40. Jentsch A., Beyschlag W. (2003) – Vegetation ecology of dry acidic grasslands in the lowland area of central Europe. Flora 198, 3-25. Kendzia G., Reissmann R., Neumann T. (2008) – Targeted development of wetland habitats for nature conservation fed by natural inflow in the post-mining landscape of Lusatia. World of Mining – Surface and Underground 60-2, 88-95. Kidron G.J., Yaalon D.H., Vonshak A. (1999) – Two causes for run off initiation on microbiotic crusts: hydrophobicity and pore clogging. Soil Science 164, 18-27. Lemmnitz C., Kuhnert M., Bens O., Güntner A., Merz B., Hüttl R.F. (2008) – Spatial and temporal variations of actual soil water repellency and their influence on surface runoff. Hydrological Processes 22,1976-1984. Leys J.F., Eldridge D.J. 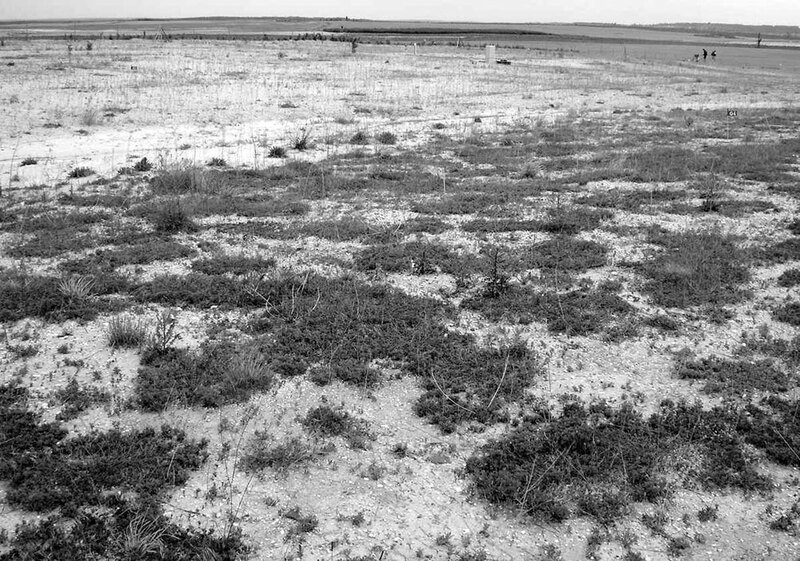 (1998) – Influence of microbiotic crust disturbance to wind erosion on sand and loam rangeland soils. Earth Surface Processes and Landforms 23, 963-974. Schaaf W., Biemelt D., Veste M.(2009) – Monitoring der initialen Bodenentwicklung im künstlichen Wassereinzugsgebiet “Hühnerwasser”. InJahrestagung der Deutschen Bodenkundlichen Gesellschaft 2009 “Böden - eine endliche Ressource”, 05-13. September, Bonn. Berichte der Deutschen Bodenkundlichen Gesellschaft, 4 p. (http://eprints.dbges.de/208/). Tisdall J.M., Oades J.M. (1982) – Organic matter and water stable aggregates in soil. Journal of Soil Science 33, 141-163. Uchida T., Ohte N., Kimoto A., Mizuyama T., Changhua L. (2000) – Sediment yield on a devastated hill in southern China: effects of microbiotic crust on surface erosion process. Geomorphology 32, 129-145. Vandevivere P., Baveye P. (1992) – Effect of bacterial extracellular polymer on the saturated hydraulic conductivity of sand columns. Applied and Environmental Microbiology 58, 1690-1698. Verrechia E., Yair A., Kidron G.J., Verrecchia K. (1995) – Physical properties of the psammophile cryptogamic crust and their consequences to the water regime of sandy soils, north-western Negev Desert, Israel. Journal of Arid Environments 29, 427-437. Veste M., Littmann T. (2006) – Dewfall and its geo-ecological implication for biological surface crusts in desert sand dunes (north-western Negev, Israel). Journal of Arid Land Studies 16-3, 139-147. Veste M., Schaaf W. (2010) – Atmospheric deposition. In Schaaf W., Biemelt D., Veste M., Hüttl R.F. (Eds. ): Initial Development of the Artificial Catchment ‘Chicken Creek’ - Monitoring Programm and Survey 2005-2008. Ecosystem Development 2, in press. Veste M., Littmann T., Breckle S.W., Yair A. (2001a) – The role of biological soil crusts on desert sand dunes of the north-western Negev (Israel). In Breckle S.W., Veste M., Wucherer W. (Eds. ): Sustainable Land-Use in Deserts. Springer, Heidelberg-New York-Tokyo, 357-367. Veste M., Littmann T., Friedrich H., Breckle S.W. (2001b) – Microclimatic boundary conditions for activity of soil lichen crusts in sand dunes of the north-western Negev desert, Israel. Flora 196-6, 465-476. Wessel A.T. (1988) – On using the effective contact angle and the water drop penetration time for classification of water repellency in dunesoils. Earth Surface Processes and Landforms 13, 555-561. Yair A. (2001) – Soil crusts and water redistribution in Israel. In Belnap J., Lange O.L. (Eds. ): Biological Soil Crusts: Structure, Function and Management.Ecological Studies 150, Springer, Berlin, Heidelberg, New York, 304-314. Yair A., Veste M., Almog R., Breckle S.W. (2008) – Sensitivity of a sandy area to climate change along a rainfall gradient at a desert fringe. In Breckle S.W, Yair A., Veste M. (Eds. ): Arid Dune Ecosystems – The Nizzana Sands in the Negev Desert. Ecological Studies 200, Springer, Berlin, Heidelberg, New York, 425-440. Zaplata M., Fischer A., Winter S., Schaaf W., Veste M. (2009) – Development of an initial ecosystem – II. Vegetation dynamics and soil pattern in an artificial water catchment in Lusatia, NE Germany. Bayreuther Forum Ökologie 115, 124. Zaplata M.K., Fischer A., Winter S. (2010) – Vegetation dynamics. In Schaaf W., Biemelt D., Veste M., Hüttl R.F. (Eds. ): Initial Development of the Artificial Catchment ‘Chicken Creek’ - Monitoring Programm and Survey 2005-2008. Ecosystem Development 2, in press. Dans les écosystèmes pionniers, les cyanobactéries, les algues, les champignons, les mousses et les lichens sont les premiers organismes qui colonisent le substrat. Ces cryptogames forment souvent une croûte biologique dans les tous premiers millimètres de la surface (Belnap et Lange, 2001). Les cyanobactéries excrètent des exopolysaccharides (EPS) (Tisdall et Oades, 1982 ; Vandevivere et Baveye, 1992) qui, par gonflement, peuvent obstruer les pores et, par conséquent, réduire la conductivité hydraulique. Ils influencent la stabilité du substrat et réduisent l’érosion des sols (Eldridge et Greene, 1994 ; Belnap et Gillette, 1997 ; Leys et Eldridge, 1998). Combinés aux rhizines des mousses, ils forment un réseau élémentaire liant les particules du substrat. De plus, ils contribuent à l’alimentation en matière organique des sols (Veste et al., 2001a). Par ailleurs, le scellement de la surface des sols par les croûtes cryptogamiques influence les processus hydrologiques. En effet, l’écoulement de l’eau et son infiltration sont régulés par la distribution granulométrique des particules, la porosité et le potentiel de rétention hydrique (Verrecchia et al., 1995). Cependant, le type de croûte et le degré d’utilisation des sols dépendent de nombreux facteurs abiotiques comme les conditions microclimatiques d’interface, la stabilité de la surface, les propriétés chimiques et la granularité du substrat ainsi que le développement écosystémique (Veste et al., 2001a ; Veste et Littmann, 2006). Le développement des divers types de croûtes est souvent accompagné par une augmentation relative de la fraction fine (Danin, 1996 ; Fearnehough et al., 1998). Le plus fort potentiel de rétention hydrique (résultant d’un accroissement de la fraction limono-argileuse) combiné à la réduction de l’évaporation (découlant d’une diminution de la vitesse des vents et de l’ombrage de la végétation) conduisent à une plus forte activité photosynthétique des croûtes cryptogamiques et à l’amélioration des conditions de développement des mousses (Veste et al., 2001b ; Veste et Littmann, 2006). Le développement des croûtes cryptogamiques dépend entre autres des facteurs abiotiques comme le climat, le « matériau-parent », la disponibilité en nutriments, le relief, la minéralogie, le tri des particules, la disponibilité en eau et l’activité anthropique. Le but de cette étude est de comparer les croûtes cryptogamiques se développant sur des substrats variés au sein de bassins versants artificiels où tous les autres paramètres abiotiques, comme le topoclimat ou les entrées atmosphériques, peuvent être considérés comme semblables. Pour atteindre cet objectif, la quantité de chlorophylle et de matière organique et la valeur du pH ont été mesurées et la structure des croûtes a été observée par microscopie optique. De plus, le régime aqueux des croûtes a été caractérisé par des tests évaluant leur pouvoir absorbant ou hydrofuge. Au sein de deux impluviums artificiels situés dans un espace remis en culture à partir d’une ancienne mine à ciel ouvert en Lusatia, Brandebourg méridional, Allemagne, il a été possible d’étudier l’influence des croûtes cryptogamiques sur le développement de l’écosystème dès ses origines. Le substrat du bassin-versant de Hühnerwasser a été remodelé en plan incliné. Pour le bassin-versant de Neuer Lugteich, nous avons étudié les types de croûtes sur la catena d’une dune artificielle. Peu après le remodelage des surfaces, différents cryptogames apparaissent. Pour les deux bassins versants, nous avons défini trois types de croûtes cryptogamiques : les croûtes à cyanobactéries et algues vertes à la surface des sols dénués de végétation (H1, L1 ; fig. 5 et fig. 6), les croûtes à cyanobactéries et algues vertes entre des plaques éparses de végétation (principalement Trifolium arvense à Hühnerwasser et Corynephorus canescens à Neuer Lugteich (H2, L2 ; fig. 5 et fig. 6), et les croûtes associées à des mousses dans les zones où la végétation est dense (H3, L3 ; fig. 5 et fig. 6). Parmi les autres graminées fréquentes à Hühnerwasser, on rencontre : Agrostis capillaries, Calamagrostis epigejos, Poa palustris et Bromus tectorum. La distribution de ces espèces y est généralement très hétérogène (Zaplata et al., 2010). Les substrats des bassins versants se distinguent par leur acidité (pH à Neuer Lugteich = 5,1 ; pH à Hühnerwasser = 7,0) et leur granularité. Les différences granulométriques de la fraction fine entre les sites expérimentaux sont importantes en termes de développement des croûtes et influencent largement les processus hydrologiques et érosifs. Les rétroactions entre les croûtes cryptogamiques et les processus géomorphologiques diffèrent d’un site à l’autre. Les différents régimes d’installation induisent des qualités de substrat différentes. Ces différences microscopiques à l’échelle des micro-habitats ont de larges impacts sur le développement des croûtes et les propriétés pédologiques des deux écosystèmes initiaux. Le développement de la croûte cryptogamique sur la dune artificielle de Neuer Lugteich est étroitement associé à la succession végétale. Bien que le site de Neuer Lugteich ait quatre ans de plus que celui de Hühnerwasser, un développement rapide de la végétation n’y a été observé que récemment. La présence d’une végétation haute réduit la vitesse locale du vent et augmente la proportion de particules fines (Danin, 1996), ce qui permet alors le développement des cyanobactéries (L1) et des algues vertes au niveau de la face sous le vent des végétaux supérieurs (L2 milieu ; fig. 5 milieu). Au fur et à mesure que la densité des espèces pionnières s’accroît, la croûte cryptogamique constituée de cyanobactéries et d’algues vertes fait de même et recouvre l’ensemble de l’espace inter-végétation (L2). Dans les dernières phases du développement, les mousses sont dominantes dans la constitution de la croûte (L3 ; fig. 5). Contrairement à cette dune artificielle, sur le nouveau bassin-versant de Hühnerwasser, les croûtes cryptogamiques sont réparties selon un schéma plus mosaïqué sans qu’aucune succession claire n’apparaisse. Néanmoins, les substrats diffèrent en termes de classement granulométrique et de pH. Durant les deux premières phases de développement (L1, L2), la croissance des cyanobactéries et des algues vertes était dominée par l’occupation des surfaces sableuses ouvertes, ce qui les stabilise contre l’érosion éolienne. La plus forte capacité de rétention hydrique des particules fines améliore aussi les conditions d’humidité du sol et favorise l’installation des mousses. Sur la dune artificielle de Neuer Lugteich, constituée essentiellement de sables fins, le vent est le processus géomorphologique commandant la redistribution des sédiments. Ici, les types de croûtes peuvent clairement distinguées le long d’un transect vertical. Sur le site de Hühnerwasser, les substrats sableux à plus forte teneur en limons et argiles sont mal triés et remobilisés par les processus éoliens et de ruissellement. Dès lors, les croûtes cryptogamiques sont réparties et développées de manière très hétérogène. Par le jeu de l’infiltration (fig. 11), du gonflement et de la dislocation des substrats limono-argileux et des EPS microbiens (Kidron et al., 1999 ; Fischer et al., 2010), suivi des phénomènes de ruissellement de surface durant les épisodes pluvieux intenses, la probabilité d’incision linéaire du substrat est supérieure à l’érosion éolienne potentielle à Hühnerwasser. En raison des forces de solidarisation physique des particules et de la présence de cyanobactéries, d’algues et de mousses maintenant le substrat, la susceptibilité à la déflation y est réduite. Fig. 1 – Location map of the study sites Hühnerwasser and Neuer Lugteich near Cottbus.Fig. 1 – Carte de localisation des sites d’étude Hühnerwasser et Neuer Lugteich, à proximité de Cottbus. Fig. 2 – Overview photograph of the artificial catchment Hühnerwasser. Fig. 2 – Vue générale du bassin-versant artificiel de Hühnerwasser. H2. Fig. 3 – Location of the sampling points H1, H2 and H3 at Hühnerwasser (Gerwin et al., 2009, modified).Fig. 3 – Localisation des points d’échantillonnage H1, H2 et H3 à Hühnerwasser (Gerwin et al., 2009, modifié). 1: initial lake surface (2005/2006); 2: surface boundary; 3: fence; 4: altitude (m a.s.l., October 2005)1 : surface initiale du lac (2005/2006) ; 2 : périmètre ; 3 : frontière ; 4 : altitude (m a.s.l., octobre 2005). Fig. 4 – Overview photograph of the artificial dune at the catchment Neuer Lugteich.Fig. 4 – Vue générale de la dune artificielle de Neuer Lugteich. Fig. 5 – Top view pictures of the crusts. Fig. 5 – Vue sommitale des croûtes cryptogamiques. H1, H2, H3 = Hühnerwasser; L1, L2, L3 = Neuer Lugteich, arrow points to cyanobacteria and green algae (L2) and mosses (L3).H1, H2, H3 = Hühnerwasser ; L1, L2, L3 = Neuer Lugteich. Les flèches signalent les cyanobactéries et les algues (L2) et les mousses (L3). Fig. 6 – Top view microscopic pictures of the crusts. Fig. 6 – Microphotographies de la surface des croûtes cryptogamiques. Fig. 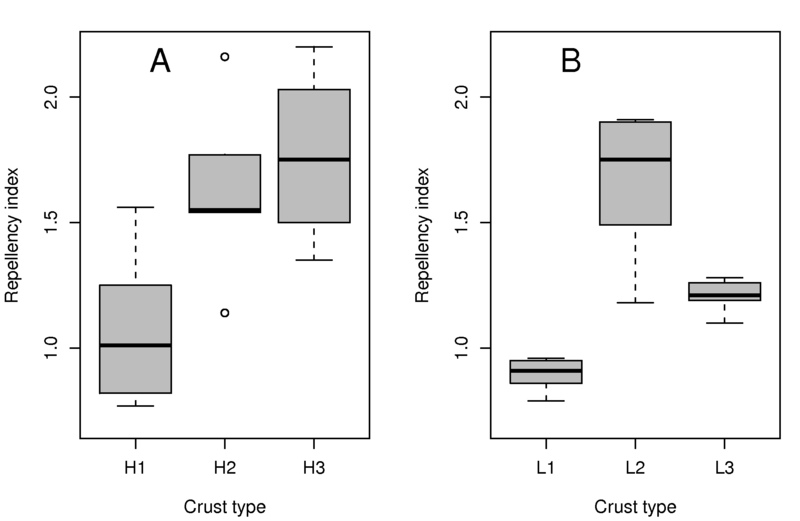 7 – Results of texture analysis (grain size classes) of crusts and subjacent substrate at Hühnerwasser (A) and Neuer Lugteich (B). Fig. 7 – Analyse texturale (classes granulométriques) des croûtes et du substrat sous-jacent à Hühnerwasser (A) et à Neuer Lugteich (B). 1: 630-<2000 μm (coarse sand); 2: 200-<630 μm (medium sand); 3: 63-<200 μm (fine sand); 4: 20-<63 μm (coarse silt); 5: 6.3-<20 μm (medium silt); 6: 2-<6.3 μm (fine silt); 7: <2 μm (clay).1 : 630-<2000 μm (sables grossiers) ; 2 : 200-<630 μm (sables moyens) ; 3 : 63-<200 μm (sables fins) ; 4 : 20-<63 μm (limons grossiers) ; 5 : 6.3-<20 μm (limons moyens) ; 6 : 2-<6.3 μm (limons fins) ; 7 : <2 μm (argiles). Fig. 8 – Boxplot of pH-values (soil/H2O = 1 : 2.5) at Hühnerwasser (A) and Neuer Lugteich (B).Fig. 8 – Valeurs du pH (rapport sol/eau = 1 : 2,5) à Hühnerwasser (A) et à Neuer Lugteich (B). Fig. 9 – Boxplot of soil organic carbon contents at Hühnerwasser (A) and Neuer Lugteich (B). Fig. 9 – Teneur en carbone organique des sols à Hühnerwasser (A) et à Neuer Lugteich (B). Range of Corg background immediately after dumping [0.16-0.22% Corg, (Gerwin et al., 2009)] indicated.Gamme de carbone organique présent dans le système juste après remblaiement [0,16-0,22 % Corg, (Gerwin et al., 2009)]. Fig. 10 – Boxplot of Chlorophyll A contents of the crusts at Hühnerwasser (A) and Neuer Lugteich (B).Fig. 10 – Teneurs en chlorophylle A des croûtes cryptogamiques à Hühnerwasser (A) et à Neuer Lugteich (B). Microinfiltrometer method, tip diameter 1.0 mm.Méthode par microfiltromètre, diamètre 1.0 mm. Fig. 12 – Boxplot of water repellency indices Ri (according to P.D. Hallett and I.M. Young, 1999) of the crusts at Hühnerwasser (A) and Neuer Lugteich (B).Fig. 12 – Valeurs des indices de répulsivité hydrique Ri (d’après P.D. Hallett et I.M. Young, 1999) des croûtes cryptogamiques à Hühnerwasser (A) et à Neuer Lugteich (B). Roland Spröte, Thomas Fischer, Maik Veste, Thomas Raab, Wolfgang Wiehe, Philipp Lange, Oliver Bens et Reinhard F. Hüttl, « Biological topsoil crusts at early successional stages on Quaternary substrates dumped by mining in Brandenburg, NE Germany », Géomorphologie : relief, processus, environnement, vol. 16 - n° 4 | 2010, 359-370.